At 5 AM, Gus yells up the stairs, “There’s a dead guy in the walk-in!” and disrupts Julia Snowden’s work-exhausted sleep. The yelling continues until she joins Gus in the restaurant, ready to disprove this absurd idea so she can go back to bed. She enters the walk-in and sees…a dead guy. Julia is now fully awake. I prefer radio alarms, but that’s just me. The dead guy sat at the restaurant bar the night before, but none of the other diners seemed to notice him. So, who is he? How did he get into the walk-in? The restaurant had been closed and locked at 1 AM after cleanup. Chris (Julia’s boyfriend and partner in the restaurant) would have noticed the leftover customer, so the body dump happened after then. The man has no ID, no bullet holes, and there is no blood on the floor. Aside from the why, how and where did the guy die? During “Fogged Inn,” Ross presents us with a thoroughly entertaining variation on the locked room puzzle, complete with a cast of Agatha Christie type retirees who reveal their connections to each other over the course of the clever, multi-layered tale. To add to the intrigue, they had received gift certificates for the same night the dead guy appeared, but Julia has no record of who purchased the certificates. And, more baffling, none of those guests acknowledged knowing each other during the long evening. As the story evolves and decades old secrets are exposed, the past overshadows the present. Dysfunctional relationships are uncovered, with unintended consequences and tragic events as the fallout. The more Julia discovers, the more items linked to the past start disappearing, and the greater the danger that surrounds her. The wonderful ensemble characters return to enthrall us with changes in Gus’ life and in the naturally developing relationship between Julia and Chris. Julia’s childhood friend, the Police Officer Jamie Dawes, is involved in the investigation, Binder & Flynn return as the irritating State cops, and Chris’ talents are revealed in delicious ways. Family members drop in, lending support, and Julia’s acceptance into small-town living seems almost certain when she’s invited to join Sit’n’Knit. Because the story takes place in the winter, there is no clambake in “Fogged Inn.” Happily, there is still a lot of cooking going on and wonderful recipes to be found at the end of the book. We get a look at what winter in a tourist town is like when all the tourists are gone, where the locals scramble to earn a living and gather at the local watering hole (Gus’s place) to trade stories. Julia and Chris share restaurant space with Gus, the lovable grump that owns and runs Gus’s at breakfast and lunch. Julia and Chris take over only for the dinner crowd, just for the off-season, as Gus’s Too. As with the rest of the series, Ross blends hardy New England life and the mystery together beautifully, so that readers enjoy learning about coastal Maine, wonderful food, and our favorite people while the bodies pop up. 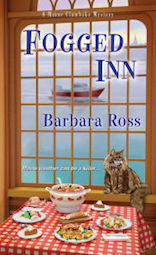 Congratulations to Barbara Ross for this well-deserved Agatha nomination for “Fogged Inn.” Malice Domestic attendees will vote at our convention at the end of April, 2017. Please visit www.maineclambakemysteries.com for more information about the series and Barb Ross’ upcoming appearances.